The town is a settlement on the biggest island in the lower Orange River region. Virtually every inch of soil is under irrigation. Enjoy driving between the many vineyards, a spit-roast, home-baked breads, several traditional desserts and locally produced wines. The origin of this little oasis’s name is in dispute. 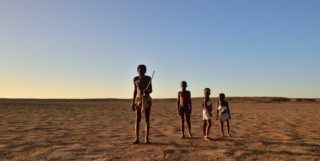 Legend has it that Klaas Lukas, a Koranna river-people leader, established a village on the banks of the Orange River near the Tier Mountains. He called the village Keimoes (mouse nest) after the colonies of mice living there. A more probable origin lies in the Nama words ‘gei’ (great) and ‘mus’ (fountain or eye). Semantics aside, Keimoes is a picturesque little town often described as a lost piece of the Boland. Main Rd. Built by Reverend Schröder in 1889. 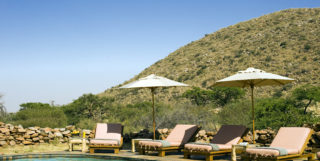 The reserve lies 4km from the town on the road to Augrabies Falls National Park. Teeming with springbok, it covers 160ha and is noted for its many aloes - mostly winter flowering. Spring sees many succulents in full flower. At the summit of the reserve, there is a lookout with a marvellous view across the Orange River Valley. A reconstructed waterwheel operates on Main Road. Offered at the Orange River Wine Cellars Co-operative. On the slopes of the Tier Mountain, you will enjoy wonderful views of the river’s islands and irrigation scheme. Tel 054 461 1006. 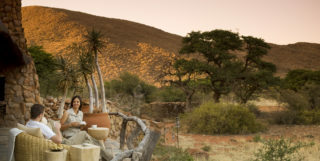 Escape to De Werf where you and your family can relax in the tranquillity of our amazing encampment filled with tame wildlife in the jewel of the Northern Cape. Eiland Eko Gaste Plaas (Eco Guest Farm) is situated on a grape-to-raisin farm among the islands of Keimoes. This small camping spot is situated on a sheep grazing piece of land. Very basic with an old caravan to sleep in and a bathroom with shower and toilet facilities. Centrally situated in a quiet residential area and close to all amenities. Kei Casa Guest House in Keimoes is a luxury one bedroom unit that offers not only comfortable, but also affordable, accommodation. The Ou Skool Guest House was an old school that closed down in the 1970s. Ou Skool Guest House offers a peaceful environment surrounded by vines. Tkabies Camping offer a peaceful environment surrounded with vines. 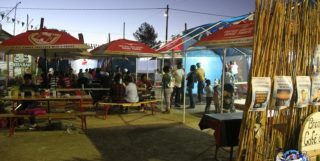 The camping sites is situated next to the N14 on your way to Kakamas on a working raisin farm.